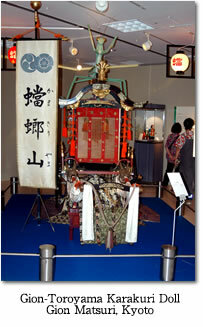 In 1733, the Tenma-chō parade float used in the the Tōshōgū Shrine festival was replaced by a new float called the Rin’nasei-sha (林和靖車). This float featured Karakuri dolls of the Chinese saint Rin’nasei, a crane with a freely movable neck and flapping wings, a boy who chases after the crane, and another boy waving flags at the front of the float. The famous Karakuri doll maker Shobei traveled from Kyoto to Nagoya to show the residents of the Denma neighborhood how to operate the crane. The following year, the residents of Tenma-chō again requested Shobei's assistance at the Tōshōgū Festival. Shobei decided to move to the Tamaya neighborhood of Nagoya, adopting the toponym “Tamaya” and changing his name to Tamaya Shobei in the process. This was during the period (1730-1739) when Tokugawa Muneharu was in power as the head of the Owari clan. Muneharu's policy of supporting festivals and other spectacles thus fostered the first Tamaya Shobei. Splendid floats were displayed each year in the Tōshōgū Festival during the years of Tokugawa Muneharu's reign. 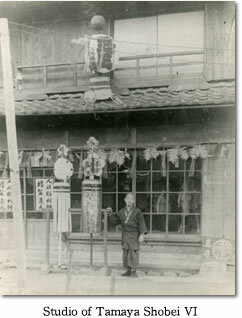 This festival was a source of stimulation for the residents of Owari and led to the creation of Karakuri float parades through the region, spurring competition between the province's craftsmen. During an era in which austerity was enforced in other regions of Japan through Yoshimune's frugality edict, the Owari clan's territory, with Nagoya at its heart, protected the legacy of Takeda Karakuri, Yamamoto Ichiza, and others. 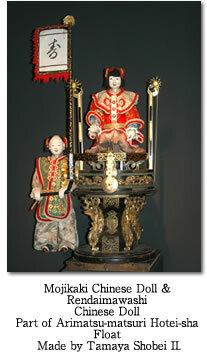 Thanks to parade float Karakuri culture, this heritage was preserved for future generations. The vigor of Karakuri parade float culture in Nagoya and the surrounding area has nurtured and sustained the Tamaya Shobei family for nine generations. They are the only Karakuri doll maker household of their kind in Japan. 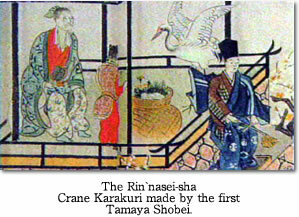 The first generation Tamaya Shobei was an accomplished craftsman in Kyoto who specialized in cranes and other animal Karakuri dolls. He came to live in Nagoya after first traveling to the city to work on the Karakuri crane which is a part of Tenma-chō's Rin’nasei-sha parade float. A carp Karakuri in use on the Ryūmontakiyama float in the Otsu festival is also believed to be his work. 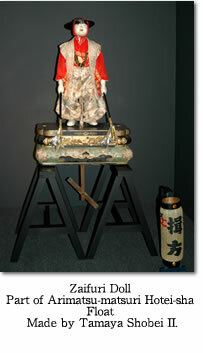 A character-writing Karakuri doll that is part of Arimatsu-chō's (present-day Midori-ku) Horiteisha float is the work of the second Tamaya Shobei. The third Tamaya Shobei's creations include a flag-waving doll belonging to the Nakamoto neighborhood of Komaki City, a doll which performs handstands on top of a plum tree belonging to Inuyama City's Tomachi neighborhood, and a flag-waving doll and dancing boy who transforms into a bird on Nishibiwajima's (present-day Kiyosu) Kōjin-sha float. 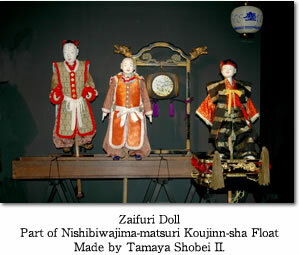 These dolls are still used to this day in local festivals. The fourth and fifth generations of the family did not leave any evidence in the form of dates or names of craftsmen, but researchers from the Aichi Parade Festival Research Group have identified some 40 works made by them. The sixth generation Tamaya created the Urashima Tarō scene used by Shinmachi, Inuyama City. 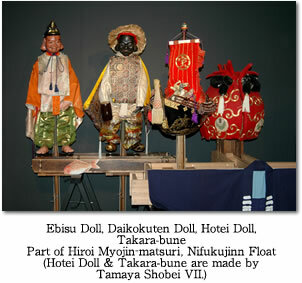 The seventh generation Tamaya repaired and crafted a number of Karakuri dolls during the period after World War II. In addition, he restored a unique float used in the 1300-year-old Gion Festival. 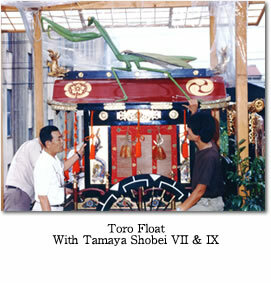 The float, called the Daitōrō to Goshoguruma, had been in use since before the Ōnin War. The float was brought back into use in 1981, after an absence of over 110 years. 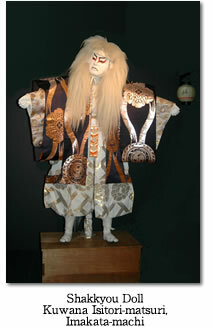 Since then, the ninth generation Tamaya Shobei has been in charge of operating the Gion-Tōrōyama Karakuri dolls. Based on a Chahakobi (tea serving) doll diagram from the Karakurisui, in 1970 he resurrected the tea serving doll with a special Tamaya Shobei design.